Make sure Clyde, one of the four enemies from Pac Man, doesn't get you before you board that train. Photo by Billy R.
No wonder Stockholm receives some of the highest customer satisfaction scores in all of the world’s public transit services. In addition to placing an emphasis on service, value for money and customer information, Stockholm’s metro system also works to create an experience around public transit by including fun and nostalgic art in stations. The latest eye-capturing art from Stockholm’s metro stations includes pixilated 8-bit art inspired by classic video games. 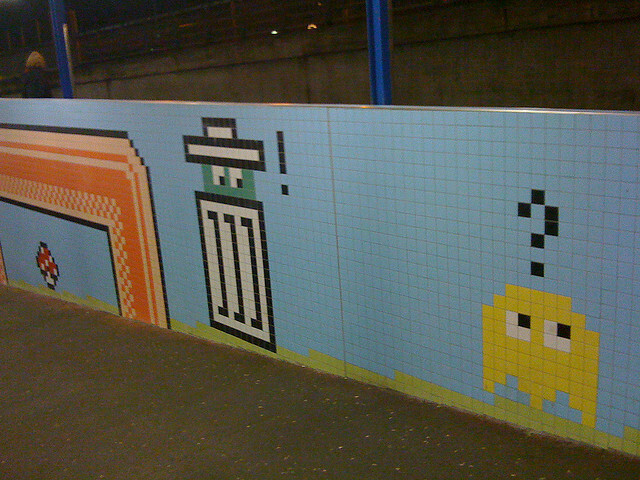 Run by the Storstockholms Lokaltrafik (SL), the Greater Stockholm Local Transit Company, the metro stations house familiar characters and images from Mario Brothers, Pac Man and Space Invaders. Here are some additional examples of art in Stockholm’s metro stations. 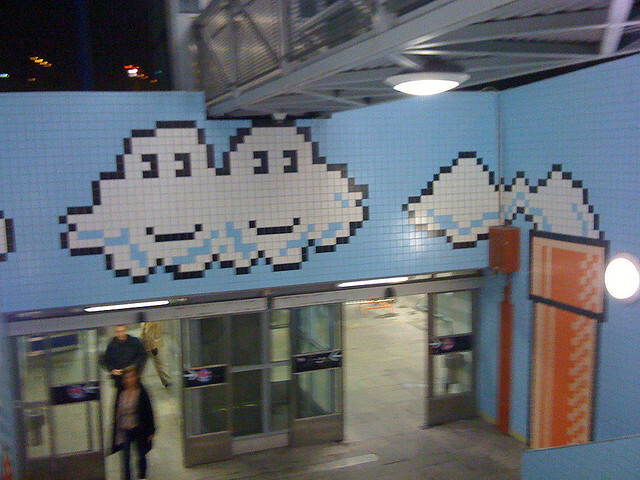 Lakitu's clouds from Mario Brothers are here to greet commuters as they enter the metro station. Photo by Billy R.